A recent shakuhachi evaluation in the shop brings up the subject of a common tuning error among new makers. I thought it might be helpful to post it here. One of the many head scratchers with shakuhachi making! A common tuning error found on shakuhachi by new makers is a flute that plays progressively flatter when descending the scale. In other words, in otsu, if (I) is considered on pitch, (RI) might play 2 cents flatter than it should be, (CHI), 4 cents flatter than it should be, (RE), 6 cents flat, (TSU), 8 cents flat and (RO),10 cents flat. One cause of this tuning error is drilling and tuning holes one at a time. For example, lets say a 1.8 without holes plays (RO) directly on D. Then, the first hole is drilled (closest to the root) and tuned exactly on F. Then the second hole is drilled and tuned exactly on G. And so on. This method might appear to produce a well tuned flute. However, what happens is that (RO) will flatten slightly when the first hole is drilled. When the second hole is drilled (TSU) will flatten slightly and (RO) will flatten even further. The teeter-totter effect continues with each hole drilled until the last hole drilled (I) is the only note on pitch. One way around this is to be aware of the degree of pitch change that will likely occur and cheat in that direction. For example, if (RO) plays about 10 cents sharp without holes, you'll know that it will likely play closer to pitch when all holes are drilled. Keeping that in mind, each hole drilled should be progressively closer to the mark. By drilling all holes before undercutting and fine tuning, it's more likely that the tuning will fall into place. Larger holes increases the tuning discrepancy. Smaller holes minimizes it. I had wondered about this, I used to do more work on each hole immediately after drilling, now I do a light cleaning and finish drilling all the holes before coming back to tuning and bevelling. However, I am tuning to the length of bamboo, not to particular pitch, i.e. 'G', the flute is in tune with itself, along the way some flutes happen to be closely tuned to a particular key and are suitable to play with in an ensemble. Previously I found myself opening Ro to sharpen it, after several observations of this I came to that assumption that drilling the holes was influencing the pitch as you indicate. Perhaps Josh can offer an explanation. I think with each hole the bore profile is being widened and flattened, though this seems more like a layman's deduction. I'm sure all this depends on exactly how one approaches tuning. For me, the teeter effect is present regardless if I'm tuning to a particular tonic or tuning to length. Perhaps you are saying the same thing here? I think with each hole the bore profile is being widened and flattened, though this seems more like a layman's deduction. That would be my layman's deduction as well, Kel. I recently brought some of my flutes for my teacher to try out and each one had the same problem you described. I was thinking it was my playing, since I am fairly new at it. Thanks for the tips. Yes, I am saying the same thing Ken, I tune only 'by ear', as tuners all seem to be visual appliances so far, only time I struggled with a tuner I screwed up ! But, yes we are in agreement here. I wanted 'darker' toned flutes and each time I was opening Ro to sharpen it the flute was getting brighter, so I had to think differently. Now I tend to add a mil or two to flatten each hole, reducing as you indicate, and keep Ro relatively sharp, then adjust each hole until the flute is tuned with itself. Perhaps not too technically controlled but I think at the end of the day I get good results and walk the path to the goal rather than applying 'what one is supposed to do' and hoping that works. But ther continue to be challenging mysteries, like why one hole has no sibilence while the others do ? As counterintuitive as it is, the width of the bore has almost nothing to do with the pitch, though it does affect the timbre by changing the proportion of the partials present. To be strictly honest, there is a very slight lowering of pitch with larger holes in the bore because this increases end correction, and that applies also to the hole at the end, but it is quite minor. Perturbations in the bore are another matter. Within the bore--where the standing wave is oscillating--a widening at a given point will lower the pitch if it is at a pressure antinode (where the air molecules are not moving but the pressure is changing), but will raise the pitch if it is at a velocity antinode, where the pressure remains constant but the air molecules are moving back and forth. To make matters more complex, these nodes shift for every different note, and each note has partials above the fundamental, which have extra nodes. The upshot of this is twofold: First, it means that drilling or enlarging a hole can flatten one note but raise another in the first mode (otsu), and it also means that since the partials are affected differently than the fundamental, octaves (kan and dai-kan) can be out of tune--and the partial composition and thus the timbre of notes can be affected. One can predict all these effects quite accurately using W curves and Rayleigh perturbation theory, but as Benade points out it is like playing a difficult game of 3D chess, since each change affects each note in a different way and everything is interactive. Except that I have noticed that wide bore flutes are always flatter than thin bore flutes of the same length. I discovered this by playing hundreds of them. Interesting Toby. This has not been my observation, but then my most important concern here is observing something repeatable that is applicable for practical results. If your explanation can help any of us make better shakuhachi, then let it ring. Whatever works. The ever changing, relative, eternal landscape for the shakuhachi maker. The valley between theory and practice! My observations also, I agree with Ken and Brian here, my very first shakuhachi was modelled on a 2.0 in length but the bore was twice the diameter, Ro was quite flat and I had to shorten the length. To say that the width of the bore has no influence over pitch does not align with saying that a note is flattened or sharpened if the diameter of the pressure node is decreased or increased. Does not compute. I do understand the idea that the presence of the partials affects the timbre, that is very interesting and a wonderfully fine detail, even if I still don't know quite how to control that. Toby, are you making Shakuhachi ? Please excuse my ignorance here, I do not wish to offend with this question but don't know the extent of your 'making' knowledge, I have the impression it may be more to do with transverse flutes ? That the bore of a culm of bamboo has variable widths along it, Jinashi that is, makes the making of each Shakuhachi unique. I particularly enjoy this. I have a flute here where Chi in otsu has a brighter timbre than the other otsu holes, if I partially cover Ri while blowing Chi the timbre is darkened and more like the other holes. My question/s, why is this, what is happening to the timbre of Chi by partially closing Re ? How is this so ? Other than partially covering Re, what else might I do to align the timbre of Chi with the rest of the otsu register ? This probably has to do with differing end correction at the utaguchi, which is a function of how much of the end is covered. 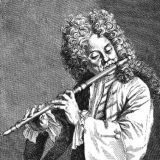 A fat flute is effectively more meri than an thinner flute using a normal embouchure. I have made a number of instruments, both jinashi and jiari, but nothing on the level of you guys or Perry. However the acoustics obey fixed laws, and I think it is important to clarify that the effects you are observing are not always being caused by what you think they are. My feeling is that if you know what can and what cannot cause what, it might help you avoid missteps and/or save time. For instance, a larger hole has a larger end correction, which is an effective extension of length of the air column of .6*hole radius. So if you fatten the bore, of course Ro is going to go flat on you. Also, end correction is affected by the ratio of the main bore radius to that of the hole. So the same size hole in a one bore will play differently than in a bore of different diameter. The math of all this is pretty complex, and since everything is interactive, it is really only good to a first approximation. There is a lot of empirical knowledge out there, which is passed on from maker to student, or embodied in good instruments. I am not arguing for anybody to throw this away and do everything on a computer, but some knowledge of what does what is probably helpful. To say that diameter does not change pitch (within certain fairly wide limits, until air mass and compliance starts taking a toll) is true, but it does not take into account some important factors in playing, such as the end corrections at the holes, especially that at the utaguchi. You can test the pitch of any tube just by slapping the end of it, and the same thing applies. Let's get back to physics: pitch is determined by the frequency of the standing wave, and that is determined by the length of the bore and the speed of sound in the medium in that bore. Nothing more and nothing less. Yes slapping the tube will give a different pitch because of end correction differences for different diameters, and in fact you will get double the end correction of a blown flute since now both ends have the same open-end correction. When you blow a flute, pitch is very dependent on how much of the hole is covered--this is a different kind of end correction that allows meri and kari. But basically, diameter does not affect pitch, although there is always end correction to consider at open holes. I appreciate the Math perspective for sure, but more particularly when I can apply it, this takes a bit more hands-on learning. Of late, I attend a lot more to the detail in the blowing end, utaguchi and chin support and how this influences the blowing angle and distance of the edge from the lips. Now I am thinking what you are referring to by 'end correction' ? But basically, diameter does not affect pitch, although there is always end correction to consider at open holes. Then why does my experience tell me otherwise? I am not saying "I played one large bore flute and it was lower than one thin flute I played". It's hundreds of flutes. And the results are consistent. For example I have a 1.8 which plays on C and big surprise it's also the fattest one I have. Nice theory but the facts tell otherwise, and I doubt it's a coincidence that all my (and other's) fat flutes have a peculiar utaguchi angle compared to all my thin flutes as you suggest. This is also the same reason why jinashi flutes of a certain length are usually flatter than jiari. Because the bore is filled in with more material, therefore has less capacity, therefore higher in pitch. Toby, I know you like your theory but has your actual experience told you that thin flutes are the same pitch as fat ones of the same length? If so that would be a unique experience because I don't know anybody else who has observed this phenomenon. I wish you were right because most of my favorite flutes are the wide bore ones and I can't use them for ensemble use due to the fact that they are all flat of concert. The exceptions to this rule are the ones which have been made specifically to compensate for this tendency. Such as my Taimu 2.3 which is A rather than Bb, like conventional 2.3. My teacher Nyoraku and I both have Shugetsu G flutes. Mine has a wider bore. It is 2.7. Jim's has the thinner bore, it is 2.8. Forum members, is there anyone out there who has played a large number of flutes and observed that the thin ones are the same pitch or lower than the fat ones of the same length? I wonder what the Math says regarding 'volume' of the bore rather than length or diameter. It is certainly my experience too that the width affects the pitch to be lower. I was therefore surprised to read your theory, Toby - with all the respect for the theories and your knowledge as well - of course. I wonder if it is a kind of same discrepancy between theory and practice as the belief, that it is only the air inside the column that creates the sound and that the material of the flute has no influence on the sound? For example, my D flute is 1.7 and all my A flutes are 2.3... just to give a few examples. It has been a consistent experience that the wider-bored flutes are lower in pitch than their thinner equivalents - also when I have been around measuring lots of flutes. Hm I dont know much about that stuff but I have a narrow bore flute (jiari) here with very thin bore also the holes seem to be smaller then common. Its exactly 54,5 cm long and plays well in D, it was repaired by Perry Yung so maybe he can say more about it. I compared it with a old Gyokusui I own, holes are nearly at the same place, lenght is the same just the bore and holes are smaller. But I have also seen a few flutes with larger bore that where lower in pitch that where made by one of my first teachers. Let's get back to physics: pitch is determined by the frequency of the standing wave, and that is determined by the length of the bore and the speed of sound in the medium in that bore. Nothing more and nothing less. Yes slapping the tube will give a different pitch because of end correction differences for different diameters, and in fact you will get double the end correction of a blown flute since now both ends have the same open-end correction. When you blow a flute, pitch is very dependent on how much of the hole is covered--this is a different kind of end correction that allows meri and kari. Physics... the speed of sound in air is constant at any given place and moment, and the frequency is cycles per second (Hz) that can be calculated by dividing the speed of sound by the wavelength. So, yes, frequency is determined by wavelength. Going further, I doubt anyone here would have much problem intuitively reckoning that the wavelength between two holes (at least fingerholes) is going to be the same regardless of diameter. Let's see... The key word here might be "basically", basics being that the wavelength, and therefore pitch is determined by the distance between the holes regardless of diameter. Never mind for now that anyone who has played even a small handful of shakuhachi has observed that fatter = flatter in the shakuahchi world. although there is always end correction to consider at open holes. In the simple case, between finger holes, diameter does not affect pitch (much), although in the real world where end correction of the open holes at the end of the tube needs to be taken into account, diameter does indeed affect pitch. Toby, Did I translate that well? Also, please note that I never contradicted the assertion that wider-bore flutes play flatter. "When a pulse of high pressure air gets to the end of the pipe, it spreads out, and that allows the reflection. What happens exactly at the end? inside the tube there is a plane wave, when the wave is radiating externally it is a spherical wave, but between the two there is some complicated geometry. In this phase, the pulse of air is not in the free, unimpeded air away from the pipe, nor in the tightly constrained environment of the pipe. It is somewhere between the two: unconstrained on one side, but constrained by the pipe on the other. As we explain above, the reflection is caused by suction that results when the momentum of the pulse of air takes it away from the pipe. But this suction doesn't appear immediately when the pulse reaches the end of the pipe, but a little later, as it starts to spread out. So the reflection appears to occur slightly beyond the open end of the pipe. To a rather good approximation, this effect can be calculated by saying that the effective length of the pipe is a bit longer than its geometrical length. The difference is called the end correction. For a closed end, there is no such end correction. For a simple cylindrical pipe as shown above, the end effect at the open end is 0.6 times the radius. Note the consequence of this: all else equal, a large diameter organ pipe is a little flatter than a thin one." OK, this is the first thing. The second (and more important) thing is that--as we all know with meri and kari--the amount of the utaguchi end shaded by the lips has a major effect on the pitch of the note. This is different than the end correction described above. The operative concept here is "the amount of the utaguchi end shaded..." This is the proportion of what is left open to that which is covered. Now, due to the timing of the air jet, the distance from the lip aperture to the utaguchi edge has to stay within a certain range in order to sound the note. This means that you have to cover more of the end of the wider-bore flute with your mouth and chin in order to have the same lip-to-edge spacing. This flattens the pitch of the whole flute, and significantly, as compared to a narrower bore instrument. And that is exactly what I said earlier, but no one seems to have read it. You may think this is splitting hairs, but the plain fact is that it is neither the volume inside nor the diameter of the tube that determines pitch, but rather what you have to do to play it that makes the distinction. Am I the only one who thinks that knowledge is important? https://ccrma.stanford.edu/marl/Benade/ ---then go to "Writings"> 70s>1977>"Acoustical evolution of wind instruments"
This is a course paper by Arthur Benade, probably the greatest woodwind acoustician of all time, and someone who consulted with many major wind instrument manufacturers in order to help them improve their instruments. He also completely redesigned the clarinet bore. Much of it does not apply to flutes, but much does, and the rest can help with a general understanding of wind instrument physics. It is pretty simple, anyone with a decent grasp on high school math should understand most of it. Obviously there is enough tradition and precedent in shakuhachi making so that makers can generally get decent instruments done by following patterns already laid down. And since we can add and subtract from the bore, and change the hole sizes after drilling, it is generally possible to fix those strange anomalies that always seem to be popping up for some reason or another. I just think that if one understands a little more clearly what does what and why, it might take some of the guesswork and extra work out of making and correcting instruments, and might even lead to innovations and improvements. OK, larger bores are flatter for that reason too. It still seems a stretch to state "As counterintuitive as it is, the width of the bore has almost nothing to do with the pitch,..." (this was the statement that started the discussion in this direction) because you've given us two acoustical reasons why the larger bore significantly affects pitch. Am I the only one who thinks that knowledge is important? Of course not, but you could have presented the interesting information about why bore size affects pitch in a manner that wouldn't have caused so much debate. To say that bore size does not affect pitch is an erroneous statement and individuals at the BBQ jumped on you for it. It doesn't mean we're a bunch of Luddite's you know. Indeed. Einstein, for example, is known to have opened the legs of many of his female acquaintances before eventually letting go. I just think that if one understands a little more clearly what does what and why, it might take some of the guesswork and extra work out of making and correcting instruments, and might even lead to innovations and improvements. A lot of good stuff to think about here! As Mark Twain said, "The sign of Intelligence is to be able to hold two conflicting thoughts in your head at the same time".